Business has been good at Timberline Steaks & Grille on Concourse C of Denver International Airport—and for good reason. Customers are walking out with bellyfuls of prime meat, beer and wine after paying below-menu prices – if they have the right credit card. Last September, Timberline partnered with travel rewards company Priority Pass to give certain credit cardholders a $28 meal credit to use multiple times – the first DIA restaurant to do so. Nine months later, Timberline said the program is to thank for a significant boost in traffic: In May, rewards members accounted for over $400,000 in sales. However, the impact on the restaurant’s bottom line is less certain. Priority Pass traditionally has given members access to airport lounges through cards such as Chase Sapphire Reserve or American Express Platinum. Last August, the company announced it would expand its member benefits to include restaurant credits at certain airports in the U.S. and abroad, signaling a shift away from lounges that were becoming more crowded. Airport officials wouldn’t say whether they’ve received complaints about Denver’s airport lounges becoming more packed in recent years. Timberline’s management chose to work with Priority Pass on its own, and DIA was watching the deal closely, DIA spokeswoman Emily Williams said. Steinberg said the restaurant recorded about 6,000 Priority Pass check-ins during the program’s first 30 days last year. That number had tripled since then, with nearly 18,000 check-ins for May, or 38 percent of Timberline’s total business. But the increase in sales doesn’t necessarily mean increased profit. The rewards program reimburses Timberline just $23 of the $28 credit; the remainder goes back to Priority Pass and its parent company, The Collinson Group. Then there’s the matter of service. Priority Pass diners may expect a cheap or even free meal, but the restaurant credit can’t be used towards the gratuity. That doesn’t always bode well for the wait staff. When the program started, Steinberg estimated only 25 percent of Priority Pass members tipped their servers appropriately. But the restaurant raised that number to at least 75 percent today through coaching and printed notices. 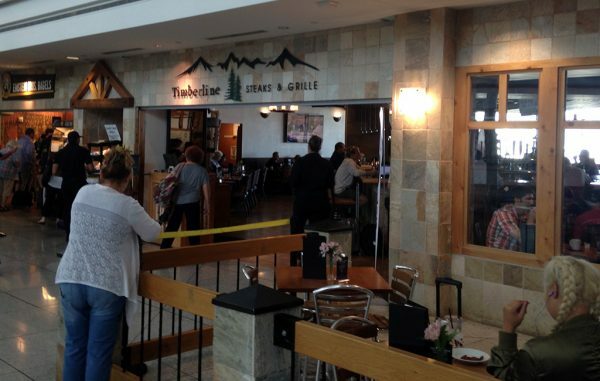 Timberline signed a year-long contract with Priority Pass, and Steinberg said the restaurant won’t know if it benefited from the deal until the end of summer. He didn’t rule out asking for a larger reimbursement for the 2018-19 year. 2 Comments on "Business booms for DIA steakhouse – with a catch"